For a mere comedian and talk show host, Jon Stewart has amassed tremendous political clout. Who else could get away with calling the President "dude" during Barack Obama's appearance on The Daily Show in October 2010? Just days later, his "Rally to Restore Sanity" with cohort Stephen Colbert drew crowds estimated over 250,000 to the Mall in Washington, DC — give or take a billion. From the beginning, Stewart has supported the Green movement. 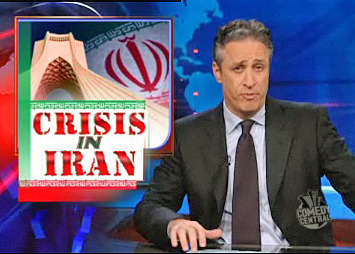 The week of Iran's disputed Presidential election, Stewart called the popular street protests in Iran an "intense and courageous display" [watch video of the entire segment below]. "How do we win with you people over there?!? We help overthrow the regime in the 50's — you're mad at us, we let you overthrow your own regime in the 70's — you're mad at us! Now we're just sitting here doin' nothing, you're still mad at us!" Sarcasm notwithstanding, this bit still doesn't make a whole lot of sense, actually. The Islamic regime happens to be the unplanned offspring of U.S. meddling, born as a desperate alternative to the U.S.-imposed Shah's repressive, vice-like grip on the country. An Anglo-American coup had murdered Iran's democratic system in 1953 (a hostile act, to be sure), then propped up Pahlavi's rule for over 25 years. Not surprisingly, that made some people mad. Eventually, America had no choice but to "let" (a callous, unconscious choice of words) the unstoppable 1979 revolution against the Shah occur. The Islamic regime's illegitimacy is self evident. That does not mean, however, that America has not been trying to suffocate it with a variety of methods including "crippling" sanctions, threats and international isolation (that ain't "doin' nothing"). MOSSADEGH t-shirts - "If I sit silently, I have sinned"